Orpington Village Hall is proud to be a member of the Bromley Dementia Action Alliance and an active part of the Bromley Dementia Friendly Community. As it is now the case that one in three people born in the UK today will develop dementia later in life, it is critical that organisations, and communities, are better prepared to support their members in living with the condition and ensuring they have the best quality of life possible. to encourage and give assistance to organisations and businesses so that they can make their facilities more dementia friendly. The network of DAA groups across the country actively give training and practical guidance on how organisations can better accommodate the needs of those with dementia. Members of the alliance must create, and deliver, a three point action plan, setting out how they plan to deliver the outcomes identified in the National Dementia Declaration. Two members of our team, Lucy Jervis, facility manager, and Louise Lancaster, marketing and fundraising manager, attended Dementia Awareness training facilitated by Orpington 1st and Bromley Dementia Support Hub during Dementia Awareness Week 2018. The training included an interactive experience dubbed the Virtual Dementia Tour. Participants had their sight, hearing, touch and mobility temporarily impaired, so as to experience symptoms that a dementia sufferer may have and the impact those symptoms would have on their everyday lives. Inspired by this experience, Lucy and Louise were motivated to bring dementia friendly facilities to Orpington Village Hall. 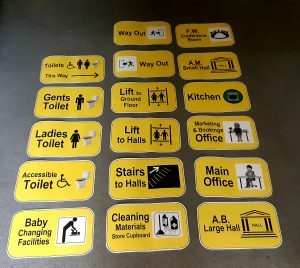 Signage – a range of in-house-designed dementia friendly signage has been produced and installed wherever appropriate. As a charitable trust with tight budgets, the guidelines and guidance provided on the Alzheimer’s website was invaluable in producing this suite of signage. Orpington Village Hall is happy to share the artwork for these signs with other organisations for free, please email to request the artwork. Toilet seats – all toilet seats have been upgraded to brightly coloured ones because this makes it easier for those with dementia to identify them. Dedicated waiting area – an area has now been identified for the specific purpose of allowing people to wait in comfort. This is also clearly labelled with a figurative sign. Staff training – dementia awareness training for all Orpington Village Hall staff has been made available. Communication and feedback – posters have been placed around the halls outlining the changes and requesting feedback from users of the hall.